Caring for a pigeon -- or a dove, as they are the basically the same bird -- involves providing for all their basic needs and keeping them safe. Pigeons are vulnerable to all kinds of predators, so if you keep them outdoors, make sure the neighborhood wildlife or loose cats and dogs can't make a meal of them. With good care, your pigeon might live for 20 years. If you have just one or two pigeons, you may opt to keep them in a large cage in your house. Keep the cage out of direct sunlight and away from drafts -- as well as any cats or dogs who share your household. 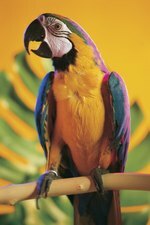 Your bird's cage should measure at least 2 feet high by 2 feet wide and 2 feet long, but a larger cage is preferable. Clean the cage daily. An outdoor pigeon coop or loft is also suitable housing, and that's where you would keep homing or racing pigeons. If you purchase or build your own coop, make sure the pigeon's flying area faces south, and keep it away from trees or other buildings. The coop must stay dry -- pigeons don't like wet environments. Lining the floor with straw or shavings, and cleaning it regularly usually keeps it dry and free from molds. Provide plenty of strong perches and avoid overcrowding your birds. Place a shallow bowl of water in the coop a few times a week for pigeons to bathe. Leave it there for a few hours and then remove the dirty water. If you keep your birds outdoors, build the coop high enough or include sufficient space in the aviary section for adequate exercise. If your pigeons stay inside, you can let them fly outside of the cage regularly -- two hours daily is ideal -- but take precautions beforehand. Pigeons also enjoy bits of breadcrumbs, mashed eggs and cooked rice. For a special treat, serve your birds meal worms. Your pigeons should always have fresh, clean water available. Clean your birds' food and water containers every day. If you have racing or homing pigeons, add supplements to their food. Provide them with grit and/or oyster shells. The latter supplies extra calcium, and isn't included in standard commercial pigeon feeds. If you have fancy or fantail pigeons, add oyster shells or other calcium supplements to their diet, especially if they are pets kept indoors. Such supplements are advisable for any indoor dove or pigeon. Pigeons reach sexual maturity at about 6 months. If your pigeon hen lays eggs and hatches chicks, she and her mate can do most of the work themselves regarding care of the offspring. Pigeons -- both male and female -- actually produce milk in their crops for their young. The crop is part of the digestive tract of many avian species, but few produce milk. The milk is far healthier for squabs, or baby pigeons, than any other type of food. If you must care for a baby pigeon without the aid of the parents, ask your veterinarian for a suitable pigeon milk recipe. She may recommend a commercial baby bird formula blended to a liquid state for newly hatched chicks and fed via syringe. When placing the syringe into the bird's mouth, make sure the tip goes all the way into the crop. Place a bit of petroleum jelly on the tip of the syringe for lubrication. Until the bird is about 5 days old, feed the liquid mixture two or three times a day. After day 5, you can switch to a larger, feeding syringe. At about 3 weeks, leave small numbers of seeds in the baby's cage, so she can learn to peck. Teach a baby bird to drink by dipping the beak in a small dish of water, also left in the cage. Wean the baby by leaving appropriate food out for her, and hand-feeding just once a day, until it's obvious she's eating and drinking heartily. Pigeons fledge between the ages of 4 to 6 weeks. By that point, they can consume adult feed.